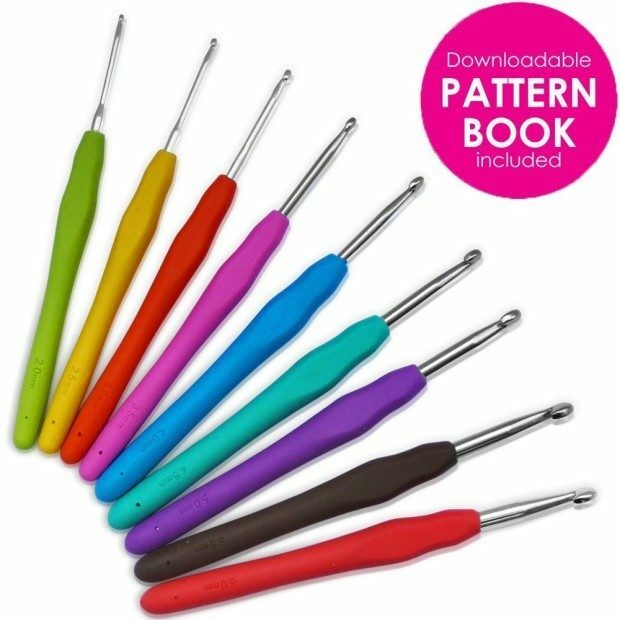 Head over to Amazon and get the highly rated Premium Crochet Hook Set With Ergonomic Grips Just $9.99! (Reg. $35!) This is a fantastic price for set of cushioned grip hooks in popular sizes. Plus you get a Pattern book to Download! Shipping will be FREE with Amazon Prime or an order of $35 or more. WHAT YOU GET – Crochet Nests Ergonomic Crochet Hook Set will exceed all expectations. The Crochet Set includes 9 Soft Touch Hooks which are not only comfortable to use, the fun funky colors make it easier to distinguish between the different Needle sizes which are displayed in mm. 2, 2.5, 3, 3.5, 4, 4.5, 5, 5.5, 6. US Conversion is printed on the package. US B, C, D, E, F, G, H, I, J. The Crochet Hook itself has a smooth aluminum shaft allowing the yarn to glide effortlessly over it, without any Snagging or Squeaking. Also Includes Downloadable Pattern Book!